Time in Objects is a speculative design project by Louise Klinker and Anab Jain that plays with the notion of time. Louise and Anab looked at various everyday objects such as books, pens and cigarettes asking what would happen if we were made visibly aware of the time it takes to consume them. 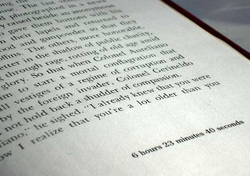 What happens if page numbers in books are replaced by the time you're supposed to take reading them? Or if you could order a 10 or 30 minute pint at the pub? The theme of the project resembles the practice of Chris Speed who in 1999 created WordTime, which is a simple control panel that allow users of Microsoft Word to calculate when their work will be done. Users simply enter the amount of words they anticipate producing and WordTime calculates when the work is completed.